Hello!!! Thanks for stopping in to read my blog once again! I received an email stating my blog hit a record amount of readers on the last post so thank you so much!!! I created the piece above last week and I posted on instagram and facebook and I got an overwhelming response! So many of you guys are interested in purchasing and fell absolutely in love with her! She is available in my shop as of now! Not the original just yet but I do have prints available! I wanted to give you guys a little insight as to how I came up with the concept and why I decided to paint this piece. I was surfing the internet for whatever reason looking at photos of black male models as inspiration for a painting. I urge you all to type in black man on google and click images. Oh my goodness the things you find!!! I got upset looking at all the racist memes and opinions of others regarding black culture as well as other cultures with people of color, so I got off google and went to pinterest. 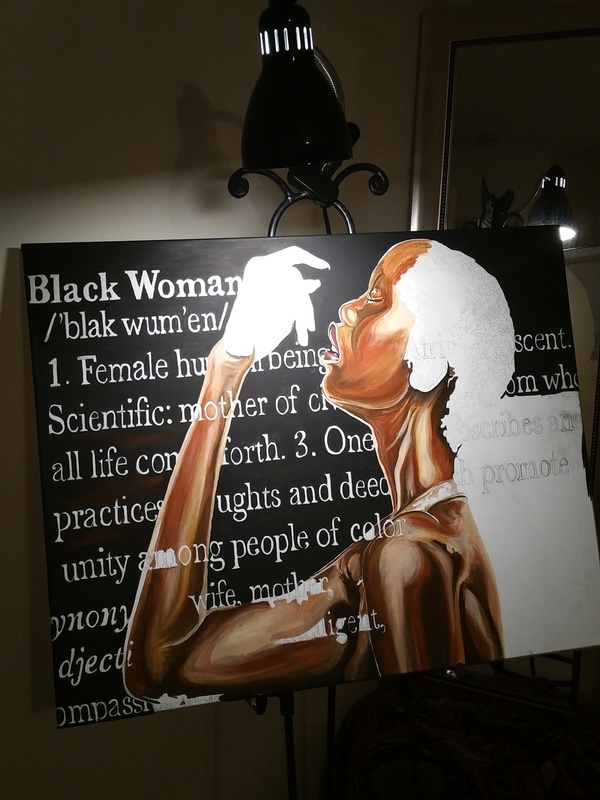 I do believe pinterest was paying attention to what I was looking at on the web because once my app opened there was this definition of a black woman just sitting there for me. It states the following. This definition was so powerful to me! Immediately I knew what to do! I drew out the description and added a black woman and embellished her body in gold and bronze. I posted her to Facebook to the group Black Artists Connected as well as my personal Facebook page and the response was amazing!! Thank you guys for your love and support! I had prints made and they are ready for purchase in the shop so stop buy and grab one. They come as high quality photo prints and canvas prints! Please send me photos once you get yours!! I decided to make "The Definition" a series! I look forward to sharing the other pieces and my process with you guys! I have placed a few in progress photos for you below! As always thanks for reading!!! Talk to you on Friday!! !